"I felt that I was in a tropical paradise." My only complain is that for all the cost of the room that the hotel should provide free WiFi. 09-Apr-2019 Verified Review, stayed from Sat Apr 06 to Sun Apr 07 2019 at a $259.38 average nightly rate. "Marriott Marquis great experience that never disappoints." Great location in downtown San Diego with an amazing view both ocean side and town side. Great food at Marina Kitchen with various cafes around if you want more. Amazing stay that I will highly recommend to any San Diego visito both for vacation and for business. 11-Feb-2019 Verified Review, stayed from Fri Feb 08 to Sun Feb 10 2019 at a $123.32 average nightly rate. With a spectacular waterfront setting in the heart of America's Finest City, the San Diego Marriott Hotel & Marina truly represents the area's best location for business and leisure. Immerse yourself in the vibrant activity that surrounds our downtown Marriott. Conveniently situated adjacent to the convention center and the Gaslamp Quarter. Enjoy effortless access to the city's most popular sights from the World Famous Zoo and SeaWorld to the sparkling beaches. By offering 110,000 sq. ft. of flexible meeting space, four tempting restaurants, and unlimited recreation, this resort-style Marriott hotel rises to every occasion, ensuring a memorable experience. Rely on us to provide the perfect atmosphere for your next conference or special event. With the harbor as your backdrop you can discover the numerous ways we set the standard in San Diego. Once contract is signed group is responsible. 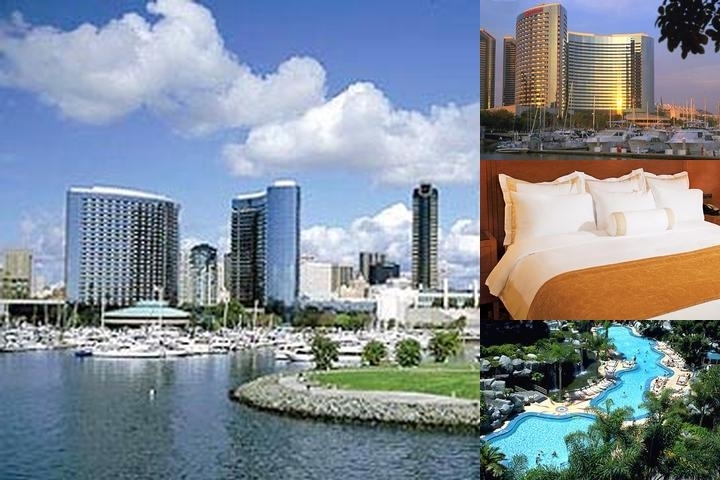 Below are the meeting, banquet, conference and event spaces at Marriott Marquis San Diego Marina. Feel free to use the Marriott Marquis San Diego Marina meeting space capacities chart below to help in your event planning. Hotel Planner specializes in San Diego event planning for sleeping rooms and meeting space for corporate events, weddings, parties, conventions, negotiated rates and trade shows. 212 x 109 x 23 Ft.
54 x 53 x 23 Ft.
109 x 53 x 23 Ft.
24 x 179 x 11 Ft.
20 x 20 x 10 Ft.
25 x 20 x 11 Ft.
20 x 20 x 11 Ft.
243 x 190 x 14 Ft.
79 x 54 x 14 Ft.
85 x 84 x 15 Ft.
79 x 52 x 14 Ft.
24 x 152 x 11 Ft.
69 x 25 x 8 Ft.
32 x 19 x 8 Ft.
34 x 30 x 8 Ft.
34 x 21 x 8 Ft.
81 x 21 x 9 Ft.
24 x 19 x 9 Ft.
32 x 27 x 9 Ft.
43 x 35 x 9 Ft.
35 x 22 x 9 Ft.
49 x 29 x 8 Ft.
207 x 73 x 16 Ft.
73 x 50 x 16 Ft.
73 x 49 x 16 Ft.
73 x 57 x 16 Ft.
300 x 300 x 11 Ft.
25 x 39 x 9 Ft.
25 x 52 x 9 Ft.
38 x 23 x 9 Ft.
30 x 23 x 7 Ft.
22 x 11 x 8 Ft.
32 x 26 x 11 Ft.
30 x 25 x 7 Ft.
16 x 14 x 7 Ft.
36 x 12 x 7 Ft.
30 x 24 x 7 Ft.
24 x 20 x 8 Ft.
41 x 24 x 7 Ft.
37 x 24 x 8 Ft.
49 x 33 x 7 Ft.
97 x 71 x 12 Ft.
26 x 15 x 7 Ft.
28 x 14 x 6 Ft.
28 x 28 x 6 Ft.
22 x 26 x 7 Ft.
39 x 28 x 7 Ft.
43 x 26 x 7 Ft.
52 x 27 x 7 Ft.
23 x 23 x 0 Ft.
50 x 50 x 0 Ft.
81 x 25 x 9 Ft.
133 x 150 x 16 Ft.
103 x 150 x 26 Ft.
42 x 28 x 7 Ft.
136 x 150 x 16 Ft.
50 x 32 x 10 Ft.
20 x 24 x 8 Ft.
103 x 150 x 16 Ft.
25 x 34 x 9 Ft.
20 x 34 x 9 Ft.
51 x 75 x 26 Ft.
133 x 150 x 26 Ft.
68 x 34 x 9 Ft.
52 x 37 x 16 Ft.
24 x 27 x 11 Ft.
52 x 37 x 26 Ft.
36 x 12 x 8 Ft.
91 x 25 x 10 Ft.
49 x 73 x 16 Ft.
136 x 150 x 26 Ft.
28 x 29 x 11 Ft.
15 x 26 x 7 Ft.
11 x 22 x 7 Ft.
20 x 22 x 8 Ft.
51 x 75 x 16 Ft.
24 x 111 x 11 Ft.
22 x 35 x 9 Ft.
14 x 16 x 8 Ft.
14 x 28 x 7 Ft.
30 x 24 x 8 Ft.
38 x 12 x 7 Ft.
18 x 14 x 8 Ft.
43 x 29 x 8 Ft.
69 x 26 x 10 Ft.
30 x 19 x 8 Ft.
29 x 31 x 8 Ft.
50 x 73 x 16 Ft.
27 x 33 x 8 Ft.
90 x 30 x 8 Ft.
240 x 150 x 16 Ft.
53 x 500 x 0 Ft.
57 x 73 x 16 Ft.
55 x 27 x 7 Ft.
19 x 27 x 9 Ft.
33 x 49 x 8 Ft.
19 x 32 x 9 Ft.
44 x 29 x 8 Ft.
240 x 150 x 26 Ft.